Opera buffs with a taste for the not too distant past will rejoice over these six CDs, which Decca has aptly designated "Classic Recitals." Each CD is a literal reproduction of a single LP, with no other material added. Instead of a plastic jewel box, Decca has housed each CD in a digipak, and in lieu of new notes and cover art, the label simply has used a photographic reduction of the front and back of the original LP covers. What this means, unfortunately, is that the program notes are essentially illegible unless you own a magnifying glass. Nothing in these notes has been updated; the news that Corelli is no longer among the living, for example, is not allowed to interrupt the nostalgic trip back in time. Some of this material has appeared on CD before, but much of it has not, and that is what makes these six releases particularly welcome. 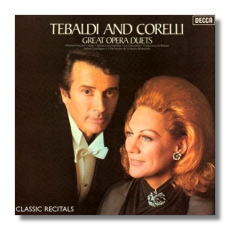 The Tebaldi and Corelli LP was recorded in 1972 when both singers (the soprano especially) were nearing the end of their professional careers. Because Corelli had been a recording artist for EMI, the pairing of these two singers was a novelty, and as both of them had legions of admirers (and still do), the LP was bound to be a hit. It took quite a bit of charity, however, to pretend that time hadn't wreaked its toll on these two voices. It is not just freakishness that leads Tebaldi to sing two mezzo-soprano roles on this LP: Aïda's Amneris and La Gioconda's Laura. Even so, her high notes are squally, and her tone is in the process of becoming desiccated and hollow. One also feels that she has not stepped into these roles as completely as she would have, had she performed them on stage. Corelli sounds considerably more comfortable. His heroic if unsubtle style is appropriate for the material. Those who love Corelli will not be disappointed; those who dislike him will not find that any of his idiosyncrasies have been corrected here! The highlight of the program is the almost 19-minute duet from Riccardo Zandonai's Francesca da Rimini, an opera still waiting for its time to come. Guadagno conducts understandingly. 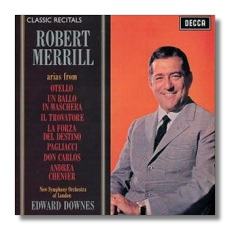 In 1963, when he recorded his recital for Decca, Robert Merrill still was in his mid 40s. He had been singing since World War Two, and was Toscanini's baritone of choice for his famous NBC broadcasts of La traviata (1946) and Un ballo in maschera (1954). Even so, I feel that Merrill didn't always get the respect he deserved. First, he didn't shy away from popular material. Second, then as now, there were those who held the bias that an American singer was out of his element in the European operatic repertoire. The fact that Merrill was Jewish must have been additionally threatening to some. Well, let them hear this recital and be silenced, because this is first-class singing by any stretch of the imagination. Next to his great predecessor Leonard Warren (and Lawrence Tibbett before him), Merrill had the more handsome voice. He could be a lover and a hero as convincingly as he could be a villain – the excerpt from Don Carlos is proof of that. Every role he sang was invested with personality. As an example of the beauty of the baritone voice, this CD is tough to beat, but it's also a fine example of how one beautiful voice can illuminate seven different roles and make each one distinct. Downes is a gripping conductor, and the engineering remains quite vivid. 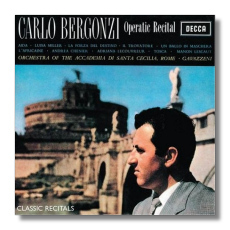 Bergonzi's 1957 recital, recorded in Rome, is every bit as thrilling, and for many of the same reasons. Bergonzi seldom failed to earn anything but the deepest respect from his colleagues and critics – here was a tenor who had a well-developed brain to go along with his trumpeting voice. (It didn't hurt that he was a physically attractive man as well.) He was the consummate Verdi tenor of his era, as is demonstrated by almost half of the selections on this CD. He was born to play heroic roles – kings, warriors, and revolutionaries. When he tried to create a softer persona, he was a little less successful, but Bergonzi was a tenor who knew his strengths and his limitations, and who respected them. (An Otello late in his career was an act of sheer chutzpah, however.) This recital was recorded right of the start of the stereo era, only six years after Bergonzi had made his professional debut as a tenor. (Prior to that time, he sang baritone roles, believe it or not!) Listening to this recital, one is repeatedly moved to close one's eyes, all the better to absorb that gorgeous, heroic tone. Perhaps we took him for granted during his long career, given the outsize personalities (in more ways that one!) that were active in the operatic world at that time. The sound is glorious on this CD – although there seems to have been a fair amount of thudding and crashing going on during the sessions – and Gavazzeni's conducting is as sensitive and as intelligent as Bergonzi's singing. Try, for example, the violins in "Celeste Aïda" and ask yourself if any other conductor has brought as much meaning to mere "accompaniments." Hilde Gueden (or "Güden") was Decca's answer to Elisabeth Schwarzkopf, at least in operetta. (Gueden's repertoire was not nearly as broad as Schwarzkopf's, and she was not so imposing a figure.) Actually, I think Gueden was a lot more fun and down-to-earth than Schwarzkopf in operetta, who could seem chilly. 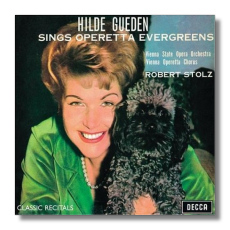 Unlike the other five CDs in this "Classic Recital" series, this collection of "operetta evergreens" contains much that is relatively unfamiliar today. Emmerich Kálmán is on the fringes these days, and Leo Fall is largely forgotten as well. Gueden's warm, insinuating voice and precise diction can make the old seem young again, however, and my only regret about the repertoire is that no texts and translations have been provided, so what is obscure will remain obscure. (That is true for all the CDs in this series.) Gueden's conductor here is Robert Stolz, who knew Viennese operetta like the back of his hand – in fact, he composed several of them himself, and one of the tracks on this CD is from his Der Favorit. The 1961 vintage recording has held up nicely. 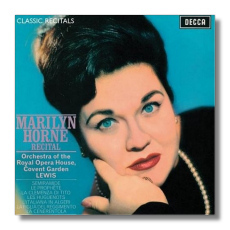 Marilyn Horne went in the opposite direction from Carlo Bergonzi: she started her career as a soprano, but later found that it was as a mezzo that she had something unique to offer. When she recorded this program in August 1964, she was in her first blush of fame, with many triumphs still ahead of her. (Her Covent Garden debut, as Marie in Berg's Wozzeck, was just months away.) The original LP made many listeners sit up and take notice; here was a successor to the great Giulietta Simionato, and then some. It is difficult not to chuckle at the assured way in which Horne cuts through thickets of Rossinian coloratura – not like a machine, however, but like a real human being. Her dark vocal coloring made her convincing in "trouser roles" (of which there are several on this CD) but she never sounded butch. Certainly her Cenerentola and L'italiana in algeri are invested with great feminine allure. It is amusing, also, to hear her taking on La figlia del reggimento, an opera her soon-to-be bosom-buddy Joan Sutherland would have such a hit with two years later (albeit in French, and with a young tenor named Luciano Pavarotti). The fine conductor on this CD is Henry Lewis, her husband at the time. (They divorced in the 1970s, and he passed away several years ago.) The engineering remains superb. 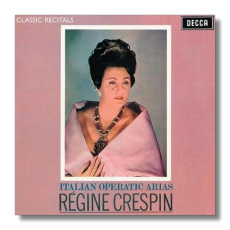 The last release is an interesting recital of Italian opera arias by one of the consummate French sopranos of the 1960s and 70s: Régine Crespin. This soprano made an indelible mark in the French repertoire, but one should not forget that she was also a memorable Tosca, Aïda, and Marschallin, and not even Wagner was beyond her abilities. Her Italian program was recorded in May 1963 when she was at the peak of her powers. Unlike the stereotypical French soprano, Crespin had a large and colorful voice, and the effect that she creates in Gioconda's "Suicidio!" and in Santuzza's "Voi lo sapete" verges on the overwhelming. She made these hapless women bigger than life. And yet, another characteristic of her vocal personality was femininity. Her Madame Butterfly, while not fragile, shows vulnerability, and her Trovatore Leonora is all heartsickness and longing. Like Maria Callas, Crespin showed that big voices can express intimate and subtle emotions. In the intervening years, the master tapes seem to have deteriorated a little; there are traces of flutter at various points in this program. One thing that hasn't changed over the years is the awfulness of the cover photo. Mme. Crespin has been lit most unflatteringly, accentuating the bags under her eyes while bleaching her skin, and her lipstick is smudged! Where were the Fab Five when she needed them?